The main characteristic of the Scandinavian design is the organic form of furniture and objects, as I already wrote in Alvar Aalto vs Ikea and The first Aalto House, the Greatest Inspiration for Your Mid Century House , Alvar Aalto was one of the first designers to be inspired by the natural organic shapes and to adopt them for his works. The Savoy vase is the most popular example. 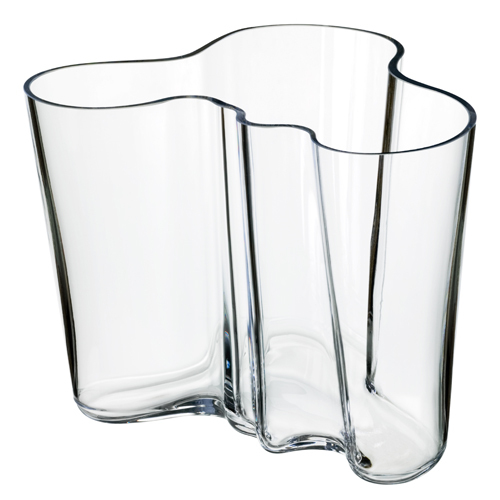 How The Alvar Aalto Savoy Vase Was Born. Even if the organic forms were not new to the Alvar Aalto stylistic vocabulary, there have been many speculations about the origin of the vase’s shape: the trees, the water, Finland’s lakes. A point that Alvar Aalto never clarified. For sure, the undulate shapes often recurred in Aalto’s works especially within his laminated wooden furniture. The origin of its name, instead, is well known. It comes form the Savoy Restaurant in Helsinki that Alvar Aalto was furnishing while participating at the glass design competition at the Paris World Fair of 1937 with the -future called- Savoy vase commissioned by the Finnish manufacturer Iittala. Alvar Aalto used many of them to furnish the restaurant -that’s why is called Savoy- and the fact that the vase won first prize in the competition made it even more popular. The most peculiar characteristic of the vase is its shape, that makes it a sculpture when empty. The Savoy vase has been, and still is, produced in many different colours and sizes by IIttala and extremely successful since its launch. IF YOU LIKED THE ARTICLE, I WOULD APPRECIATE YOU TO SHOW YOUR LOVE WITH A FACEBOOK ‘Like’ BELOW. If you found this article interesting, don’t forget that you could discover much more about mid-century joining the completely free and spam-proof Mid Century Home mailing list, now! You will receive only a weekly email with exclusive content that I don’t publish on the blog.